We are pleased to announce a second batch of 2018 graduates of the FAIMER-Keele Master’s in Health Professions Education: Accreditation and Assessment program! After completing a residential session at Keele University in February 2018, the Master’s students spent the next six months finishing their dissertations under the supervision of their advisors. Each dissertation was also reviewed by an independent marker, and the Keele University Examination Board met to review the results of the students’ efforts in mid-November. Four of the November 2018 graduates passed with distinction, and two passed with merit. Course Director Professor Janet Grant shares that she was especially delighted to have two midwives in this cohort, in addition to the doctors. Two members of the November 2018 graduating class are FAIMER International Fellowship in Medical Education (IFME) Fellows, alumni of the FAIMER Institute or Regional Institute fellowship programs who received sponsorship through FAIMER to participate in the program. 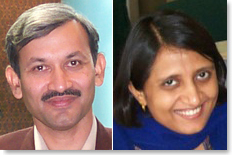 IFME Fellows Amol Dongre and Mobeen Iqbal passed with merit and distinction, respectively. Participants in the FAIMER-Keele program are able to earn a Certificate, Diploma, or Master’s Degree in Health Professions Education: Accreditation and Assessment. The program aims to empower health professions educators with the knowledge and skills to take educational standards and practice to a higher level—to develop their own practice, to improve health professions education at their institutions and in their communities, and ultimately to help bring about real and lasting advances in local health care. Applications for the FAIMER-Keele Distance Learning program are currently closed. The 2019 application will open in early 2019, and course work will start on September 23, 2019. Detailed information on the registration process, eligibility requirements, and tuition and fees can be found on the program’s website. All four IFME Fellows will begin their coursework on September 24, in pursuit of a Master’s Degree in Health Professions Education: Accreditation and Assessment through the FAIMER-Keele Distance Learning program. All three Fellows began their coursework on September 25, in pursuit of a Master’s Degree in Health Professions Education: Accreditation and Assessment through the FAIMER-Keele Distance Learning program. All six Fellows will pursue a Master’s Degree in Health Professions Education: Accreditation and Assessmentthrough the FAIMER-Keele Distance Learning program beginning in September 2014. Dr. Badyal is a 2011 Fellow of the FAIMER Institute and a 2007 Fellow of the CMCL-FAIMER Regional Institute, as well as current Co-Director of the CMCL-FAIMER Regional Institute. He is Professor and Head, Department of Pharmacology, Christian Medical College, Ludhiana; and Co-Convener of the Medical Council of India Nodal Centre for Faculty Development. Dr. Badyal was recently awarded an M.L. Gupta award by the Association of Physiologists and Pharmacologists of India for the year 2012 for his work in medical education. He is on the editorial board of a number of journals and has delivered a number of lectures on clinical trials, pharmacovigilance, ethics, research methodology, and medical education at national and international conferences and workshops. He senses a great potential and usefulness of the FAIMER-Keele Master’s degree program for the mandate of his school and Government regulating agencies, as both are very actively involved in the development of health professionals in India. Dr. Bedi is a 2007 Fellow of the CMCL-FAIMER Regional Institute. He is a Professor of Pathology at MM Institute of Medical Sciences, Ambala, India, with 18 years of teaching experience. He moderates meu_india@googlegroups.com and many other medical networks. Dr. Bedi is interested in promoting e‑learning and hopes to use his IFME fellowship to leverage the knowledge and networks achieved to make a difference nationally and globally towards improving the health standards in contemporary medical scenarios. Dr. Borda is a 2008 Fellow of the FAIMER Institute. He is an Associate Professor at the School of Medicine of Javeriana University and also an Ob/Gyn. He is responsible for the Medical Informatics Project, which includes the design of databases, multimedia, virtual patients, and interactive web projects. Dr. Borda believes that the FAIMER-Keele Master’s degree program will allow him to collaborate extensively in the development of the FAIMER Regional Institute in Latin America and the Caribbean (FRILA); the design, implementation, and assessment of a new curriculum; and the development of continuing medical education (CME) courses in health professions education. Dr. Dandekar is a 2010 Fellow of the FAIMER Institute. She is Professor and Head of Biochemistry at Seth G.S. Medical College and KEM Hospital in Mumbai, India. She is an active faculty member of the PSG FAIMER and GSMC-FAIMER Regional Institutes. Dr. Dandekar says that the nuances of medical education have always intrigued her. She believes that the knowledge gained from the IFME fellowship will help to enhance her role at each and every level of medical education, and that it will also help her to be a good mentor. She looks forward to disseminating the knowledge gained to not only faculty and students at her own institute and university, but also to other aspiring FAIMER Fellows. Dr. Kalyanasundaram is a 2010 Fellow of the GSMC-FAIMER Regional Institute. She is a Professor of Biochemistry and a senior member of the Medical Education Unit, which is a Medical Council of India Nodal Centre for basic and advanced medical education technology workshops at Christian Medical College, Vellore (CMC Vellore). She is a faculty member of the PSG-FAIMER CMCL-FAIMER Regional Institutes, and the Faculty Advisor for Elective and Exchange students at CMC Vellore. Dr. Kalyanasundaram has also served as a visiting professor at Karolinska University in Stockholm, Sweden through a teacher exchange program. She is on faculty for the Postgraduate Diploma in Family Medicine and Fellowship in HIV medicine, which are two-year distance learning programs offered by CMC Vellore. Her interests are in evaluation of educational programs, curriculum design, distance learning programs, and assessment. She hopes that an IFME fellowship leading to a Master’s in Health Professions Education will enable, support, and empower her in educational research and initiate, motivate, and sustain best practices in medical education at her institution and nationally. Dr. Shafi is a 2010 Fellow of the FAIMER Institute. She has been involved in medical teaching since 2000. She is a Physiologist by specialty and is currently working as an Associate Professor at Shifa College of Medicine in Islamabad, Pakistan. Dr. Shafi has attended various regional and international conferences and workshops on medical education, and has published articles in scholarly journals. A desire to further improve her knowledge in the field of medical education encouraged her to apply for the IFME fellowship. She explains that Pakistan is a developing country where expertise in the field of medical education is needed, and says that she hopes to improve her knowledge and skills in this field and work toward the implementation of modern trends in medical education in her country. All three Fellows will be pursuing a Master of Health Professions Education (M.H.P.E.) degree at Maastricht University in the Netherlands beginning in 2011. Dr. Bansal is a 2007 FAIMER Institute Fellow and a faculty member at the CMCL-, GSMC-, and PSG-FAIMER Regional Institutes. Through the IFME program, she seeks to deepen her knowledge of advanced topics in health professions education and, in particular, program design, to continue her growth as a leader and program developer at MUHS. Dr. Shah is a 2008 FAIMER Institute Fellow and a Faculty member at the GSMC-FAIMER Regional Institute. As an associate professor in psychiatry and Chair of the Indian Psychiatric Society (Western Zone), Dr. Shah is interested in learning how to better align the psychiatry curriculum at TNMC with the needs of the community. She also hopes to learn about innovations in teaching-learning and assessment, and to apply that knowledge at both TNMC and the GSMC-FAIMER Regional Institute. Dr. Solarte, a 2007 FAIMER Institute Fellow, seeks to improve his understanding of curricular design and implementation, faculty development, and student assessment. He plans on using this knowledge in leading the implementation of a new curriculum at Pontificia Universidad Javeriana and as a member of the organizing committee for a new master’s program in health professions education that will be offered by the Association of Colombian Medical Schools. Dr. Solarte would also like to further develop his research skills. As a member of the FAIMER Regional Initiative in Latin America (FRILA), he is interested in conducting research on the migration of health professionals in Latin-American countries. The IFME program provides support for participating Fellows to pursue advanced degrees in health professions education at selected institutions that offer distance learning programs. The program prepares participants to take on greater educational leadership roles at their home institutions, as well as at FAIMER’s Regional Institutes, with the ultimate goal of improving local health care. The program is open to both FAIMER Institute and FAIMER Regional Institute Fellows. IFME Fellows are selected by FAIMER. For more information on the IFME program, see www.faimer.org/education/ifme/index.html. Noor Fatima Ahsen, M.B.B.S., 2006 FAIMER Institute Fellow, and Sheena Singh, M.B.B.S., M.D., 2006 CMCL-FAIMER Regional Institute Fellow, have been selected as participants in FAIMER’s International Fellowship in Medical Education (IFME) program. Both Fellows will be pursuing a Master of Health Professions Education (M.H.P.E.) degree at Maastricht University in the Netherlands. Dr. Ahsen, a 2008-2009 FAIMER Institute Global Faculty Advisor, plans to focus on curriculum development, teaching methods, and student assessment. Her goal is to take on greater organizational leadership roles and make important contributions to medical education research in her position as a public health consultant in Pakistan. Dr. Singh is the first Regional Institute Fellow to enter the IFME program. She plans to study curriculum design, principles of andragogy, assessment, and project management, as well as further develop her leadership and research skills. Her goal is to apply what she learns from the program in her role as a CMCL-FAIMER Regional Institute Faculty Advisor. Tejinder Singh, M.D., D.N.B., F.I.A.P., Masters Distance Education, M.H.P.E., had his thesis, entitled “Identification of Needs and Priorities of Pedagogic Themes for Faculty Development in India,” approved in April 2009 and will receive his official degree in June. The IFME program provides support for participating Fellows to pursue advanced degrees in health professions education at selected institutions that offer distance learning programs. The program prepares participants to take on greater educational leadership roles at their home institutions, as well as at FAIMER’s Regional Institutes, with the ultimate goal of improving local health care. Originally open only to FAIMER Institute Fellows, the opportunity to enter the IFME program was expanded in December 2008 to include Fellows from FAIMER’s Regional Institutes. IFME Fellows are selected by FAIMER. For more information on the IFME program, visit www.faimer.org/education/ifme/index.html. Two FAIMER Institute alumni have been selected to pursue Master’s degrees in health professions education through FAIMER’s International Fellowship in Medical Education (IFME) program. Edwin Nwobodo, Ph.D., from the Institute Class of 2004 will enter the Master of Health Professions Education program at Maastricht University; and Avinash Supe, M.B.B.S., M.S., from the Institute Class of 2002, will enter the Master of Health Professions Education program at the University of Illinois, Chicago. The IFME program provides support for alumni of the FAIMER Institute to pursue advanced degrees at institutions around the world that have distance learning programs. These programs may include a brief residential requirement. Participants complete an extensive application and select from a list of approved institutions. IFME Fellows are then selected by FAIMER. The IFME program is part of FAIMER’s faculty development pathway, which prepares participants to implement curricular improvements at their home institutions that can lead to better health care. Fellows who complete this pathway will also be better qualified to take a leadership role in developing Regional Institutes, centers of ongoing activity that support curricular innovations aimed at addressing local heath care needs. Vivek Saoji, M.B.B.S., M.S., and Rashmi Vyas, M.B.B.S., M.D., attended a summer session at the University of Illinois at Chicago (UIC) in May. Drs. Saoji and Vyas are pursuing Master’s in Health Professions Education degrees at UIC through FAIMER’s International Fellowship in Medical Education (IFME) program. The IFME program has been redesigned to enable selected graduates of the FAIMER Institute to pursue advanced degrees in health professions education at institutions that have distance learning programs with a minimal residential requirement. This alignment of the Institute and IFME programs creates a pathway for educational leadership in international health professions education. Drs. Saoji and Vyas are the first Fellows of the redesigned IFME program to complete a residential session for their Master’s program. Dr. Saoji is a Professor, Department of Surgery, and Dean of Bharati Vidyapeeth Medical College in India. Dr. Vyas is a Senior Lecturer in the Department of Physiology at Christian Medical College, Vellore, in India. Both are members of the 2003 class of the FAIMER Institute.